Time to Make the "Reed"
Many years ago, when my son was getting into the oboe and he was learning how to make reeds, he came up to me one day and said,"Dad, you are so lucky. You can just pick up your horn and start playing without having to worry about making reeds!" I said, "Excuse me, but what do you think I am doing when I am playing slow slurs, gradually getting higher in range, then going down into the low range, then playing scales in different articulations, all this lasting 90 or more minutes? I am making my reed. That is how brass players make their reeds. Their embouchures are their reeds and some peoples reeds take longer to make than others." Warming up and maintenance practice, I feel, at least for myself and other players that I have seen, are vital to feeling ready and provide a platform of stability. A good warmup/maintenance routine can act as an excellent diagnostic tool to monitor the 'health' of ones embouchure and support systems. Life is ever changing for a person, at many levels, and sometimes we need to modify certain approaches physically and mentally to adjust to natural changes as they occur in one form or another. Having a basic, steady routine that one feels good with, and that also covers an extensive workout into a variety of playing aspects, can keep one informed and in tune with ones playing apparatus. The regularity of the routine offers a reliable point of reference for sensing any changes and gives a person time to make any adjustments. I think a good regular routine is excellent for maintaining greater longevity in ones playing life. Today I had so many errands and household things to catch up with that I couldn't do my routine at my preferred time. So, I did it late at night and it felt very productive and set me up well for tomorrow's sessions. It's never to late to make the reed! My first teachers are not known in the music world. Some people might think they shouldn't be called musicians. But this depends on what you think music is and, therefore, what you think a musician is. Lena Neren, Herman Neren, Shirley Baker and Charles Bolter are not famous musicians but they were great musicians in my eyes. Lena Neren was my grandmother. Now, this marvelous woman could take away my headaches singing a song. My grandfather, Herman Neren, was a self taught violinist from Poland, a real Fiddler on the Roof. He would play songs on his violin that would connect him to the 'old country.' He would be transported to another time and another place. I could always see a tear come down his cheek when he was playing his beloved songs. My mother, Shirley Baker, took away my fear by singing the song, "Whistle a Happy Tune," from "The King and I." My father, Charles Bolter, first introduced me to multiphonics when he would imitate an outerspace ship by whistling and singing at the same time. These people showed me that music could heal, change your state of mind, transport you in time, and inspire your imagination with magical sounds. 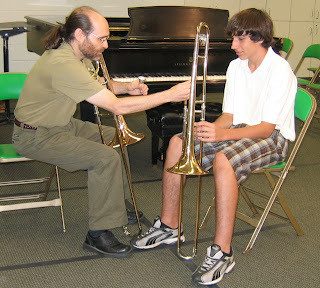 So, when I got my trombone, that's what I thought music was about and that's what I wanted to do--and still do. For them, it was a natural part of their lives. They didn't worry whether they had "chops" that day or not. Music just flowed in and out of them whether it was happy times, sad times, religious ceremonies, or just to have fun. It was a natural expression. They gave me the inspiration to first see music as a living thing. Interestingly, in Wales, I started out by trying to play my trombone at that site and the sound didn't match what I was feeling there. So, I detached the slide from the bell and just played the part that I later named the T-horn. 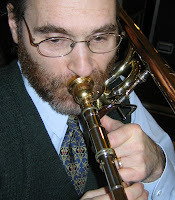 Here is a sound clip using T-horns: "Persian Immortals" from my "Occurrences" CD. It is also avaiable as a single track MP3 on the iTunes page for this CD. By the way, this piece was written several years ago and was inspired by an ancient legend. It has no relationship to any current world events. In my Preview, Review and Video Too post, I said that I'd write more about breathing in a later post, since it's mentioned in the video with John Peter. So, here it is! This is the same exercise I gave John but you don't see it on the video. This breathing exercise was given to me by one of my principal teachers, former principal trombonist of the Minnesota Orchestra, Steven Zellmer. Over the years, I have found a deepening value for this relatively simple exercise and have developed a number of variations myself, some of which I'm including here. It is excellent for locating tension that might exist in the stomach, chest and especially the shoulders. Done on a regular basis, this exercise helps in the economy of breath. While doing the inhale for six counts, one needs to measure the breathing, making sure not to take it in too quickly or you can be full well before beat six! Practicing the three count and the two count variations, one can feel the breath at faster speeds. These variations are excellent for monitoring any tension that could enter your body when air speed is increased. 1. Focus your eyes on something straight ahead of you. 2. Do the exercise three times consecutively with the six counts at a moderate speed. 3. Repeat using three count variation. 4. Repeat using the two count variation. Oftentimes, players already have too much air in their lungs, so it can be useful to exhale for a count of two before starting the inhale. There is so much that can be said about breathing. Find your own ways with this exercise and be careful not to overdo it so you don't hyperventilate. By the way, this exercise is good for relaxation too! Click here for "before" photo. "After carefully setting the dials to the metrotune, Oscar was ready to practice his trobo slide exercises that his 7th degree mentor had assigned him. 'OK, I'll start with the 4 octave D flat quarter tone scale sequence. Ooops! I forgot to connect my air tank to the mouthpiece funnel! Oh boy, that is my 3rd demerit this practice session! One more and I'll have to clean the entire theater again! So here I go.... Hmmmmm. The metrotune was set at quarter note equals 4. Oscar needed to hold each tone 64 counts at this tempo, all at a dynamic of forte to the 25th power. This was in preperation for his weekly promotional. He was actually on probation for the past two weeks and if he did not pass this promotional, he would be expelled from the Academy of Sonic Scieneces. Oscar was just beginning the 6th tone in the scale sequence when his friend, Dobey, interrupted him. 'Oscar, your release time of the previous note was early and you lost 38 vibrations in sonic stability!'" Fashions come and fashions go. Stay in tune with what you know. Water your root and watch it grow. Know thyself and you will flow. A full sound is maximum vibration in a particular space or body (human acoustic). Fixed ideas about what a full sound (or anything else) is can cause conflict in a person if they compare themselves to others without enough broader understanding, i.e., take into consideration the fuller context and value of individual uniquenesses. You can learn from the current style, but that doesn't mean you have to become it to be whole. Otherwise, how will you be able to fulfill your own destiny--or even find out what it is? If you wear a shoe size 7-1/2 C and your foot fits that shoe fully, then why would you insist on trying to wear a 12-1/2 D shoe? Even though what you "can do" might seem "smaller" sometimes, doesn't mean it is lesser--and it doesn't meant you can't grow. Here's a story: A student asked me if I thought they had a big, full sound. My response was that they had a medium, small size sound but it was very full within itself. They were very upset with my response! And that's when I gave him the analogy of different shoe sizes. Many times brass players play equipment that is too big for them. They think this will help them get a fuller sound. But they only are thinking of size, not quality of resonance, which, in the end result, creates the effect of fullness. I've also seen many people damage themselves as a result of trying to broaden their sound too far away from their natural physiology and nature. Better to be yourself (and know what that is) so you can discover the fullness of your potential in music--and in life. Some of you have seen, in an earlier post, the video clip of me and my nephew, John Peter. Here is another one. We were spending some extra time together after a lesson. What catches me right now is how important it is to review and spend time with something. There is a ton of stuff in these short video clips that I am discovering every time I review them. You also can find and confirm the value of review, if you'd like, by seeing what else you can discover in this short video. People often say that they get so much more from a movie or book when they see it or read it a second or a third time. Life these days gets very busy and we don't always have the time to spend the time we would like on the very things that we enjoy. That's when it can be useful to review our priorities. Several years ago, my wife, Carol, and I were in France. We were staying at an incredible place somewhere in the Loire. There was a picture on one of the walls that really caught our attention. It was a sketch of a parrot wearing a French beret and some funny little clothes, holding a baguette under its wing. I looked at it and said, "A French monkey!" The reason I said "monkey" was because the clothing the parrot was wearing looked to me like the outfits worn by organ grinder monkeys. 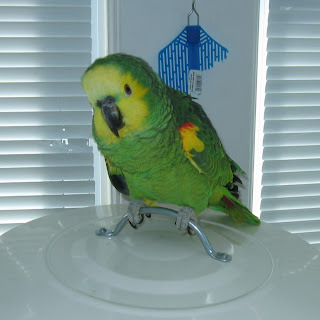 Years before we made that trip, I used to play my recorder for Atlantis, the actual name of our parrot. I started playing this funny little melody that came to me while looking at her and she would dance and bob her head and also sing along with the right notes and timbre of the recorder! This photo of Atlantis captures her mischievous nature in action--or I should say, after the action. If you notice the blinds on the window and the fly swatter in back of her, you can see the results of her beak at work! Here is a sound clip of the little melody I used to play for Atlantis on the recorder, here played on the trombone. The song is called "The French Monkey" and it's from my "Anew at Home" CD. "Music as a living thing is a fundamental core alignment that creates the internal environment in a person to experience their art as a part of life, not seperate from it." I picked this quote because it describes and explains in a concise way what music as a living thing is to me. Since I mentioned this in my Profile, I thought some of you would like to know what I meant by that statement. Have you ever been out having a meal where the music playing is not only of a kind you find not very appetizing but the volume is intolerable? Well, music is very hard to get away from, if it is playing in a place you happen to be. Whether it is in an elevator or a shopping mall or a restaurant, music can influence the whole of your experience. Now, I believe music has potent atmospheric qualities. A lot of times, people think atmospheric music is slow, soft and ethereal. Well, as far as I can tell, ALL music is atmospheric. It is the KIND of atmosphere it creates that is of interest to me. 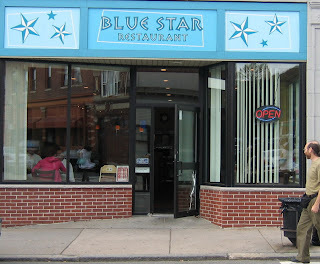 If you are trying to have a calm, relaxing meal and there is fast, loud and shrill music playing in the background, your time, most likely, will be far from relaxing--at least in the way I am thinking of it. However, some people might like to unwind from a cramped day at work to very loud, fast music. So what can be soothing to one, could be depressing to someone else. What could be fun, 'let-it-all-hang-out' music for one, could be torture for someone else. What is the solution? 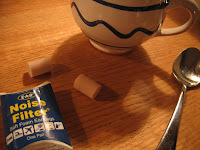 I used to carry ear plugs with me, and from my latest restaurant experiences, I might start doing it again! Music is a powerful medium. It has a permeating quality that can heal, rejuvenate, make you ill or invoke your spirit. It can facilitate many kinds of activities and affect all levels of life, including in plants and animals. What a wonderful tool! The rhythm of music links up, or attaches itself, to your automatic processes that are, in themselves, working in a rhythm and at a tempo. For those of you who have seen the video clip "After a Lesson" (in a earlier post), here is some more information about it. At the beginning of the clip, you can hear me say the word "toilet." This came about because John Peter and I were talking about mutes. I was showing him a mute called a "wa wa" mute, commonly referred to in the brass world as a Harmon mute. Many times music calls for a plunger. A plunger is rubber suction that oftertimes is used when a toilet is clogged and will not flush. This is what we were talking about just before the bit on the Harmon mute, hence, the reference to "toilet." But some very inventive jazz players, usually trumpet or trombone players, many years ago, discovered use of the plunger was a wonderful way to produce really cool effects. One of the sounds it produces sounds like a cry, Wa Wa! This wa sound is made by placing the mute in and out of the bell at various speeds depending on what kind of wa you are going for. For example, a slow wa can sound like a cry but a series of fast wa wa's can sound like a laugh, especially in a descending pitch sequence of half steps. The Harmon mute can make similar sounds but has a different timbre or tone color. I love playing with the Harmon mute and have written many pieces that call for it. If I can find one that's a sound clip, I'll post it. Also, I was showing John Peter how the trombone can sound like a didjerido when the Harmon mute is in and you are playing and singing a note at the same time. At the end of the video clip, I mention circular breathing just before the video ends. Circular breathing has its beginnings thousands of years ago (just like singing and playing at the same time, which I talked about in my last post). It was a common practice on the didjerido for the purpose of having a continous sound. It is a difficult technique to do well. Any good book on how to play the didjerido explans the technique. It is basically this: While playing a note you collect some air in your cheeks. Then you take a quick breath through you nose, at the same time pushing the air out of your cheeks to make sure there is air still going into the horn while you take a breath through your nose! I was lucky to have played with one of the worlds greatest circular breathers, former Boston Symphony tubist, Chester Schmitz. It really helps to watch someone to learn this technique! Get a didjerido video and see! Those of you who have seen the little video clip on "After a Lesson" might recall when I said to John Peter that people get embarrassed when they have to sing. So I told him to look at me and sing when I moved in front of him. What I meant was that many times instrumentalists, even extremely advanced ones, get shy when they have to sing in front of others. It is interesting because, in my view after seeing this many times, they feel very exposed, almost naked, without the instrument. They all of a sudden feel a bit vulnerable. It is easy to 'hide' behind the instrument if that is your main way of making music. The musician gets used to a certain machine to produce the tone and the pitch and to do it just with the voice is difficult, for the reason that the person is not identified with the sound of their voice, and probably hasn't made a connection to their voice, as a vehicle for their music making. I was showing John Peter that the trombone can play a note with the vibration of the lips and sing a note with the vocal chords producing two notes at once. To demonstrate that technique, the little excerpt that I played for him was from the trombone chorale in the last movement of Brahms First Symphony. Then I mentioned the didjerido. Many people think that singing a note and playing a note at the same time is a very contemporary or avant-garde technique. But the aboriginal people of Australia were doing it thousands of years ago on the didjerido! (Many ancient people employed this technique.) Makes you wonder what is original and where it comes from...? We figured out how to post on this blog the videos taken after the lesson with my nephew (see previous posts)! In this video, I was trying to inspire John Peter with a few ideas about other things you can do on the trombone, like using the Harmon mute (also called Wah Wah mute), multiphonics (singing and playing at the same time) and circular breathing (to create continuous sound). During this little after session, John Peter and I talked a little bit about using the tongue to articulate the beginnings of a note. At this point in his playing, he feels better just starting a sound with his air and lip vibration. Using the tongue can help in getting a very clear start to the tone. I demonstrated some tonguing, both single and some double tongue. Tonguing can be like a painter's using his or her brush, making different kinds of strokes for different effects. We always need to use our air, and I gave John Peter some breathing exercises. This helped his tone and articulation with the tongue. We also talked about the importance of posture and how much easier it was to take in a good full and deep breath when our backs were straight. I love working with all types of people. Perhaps because it amazes me how much I always learn--and, for a brief time, I get to experience life in a special way with another person, through the medium of music. This morning, I gave a lesson to my nephew John Peter. It was video taped. We pretended to be all by ourselves and just have some fun with bits of instruction thrown in. 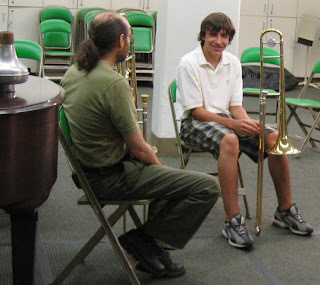 He is a ninth grader and, like many kids in school band, doesn't practice much in the summer. :-) So we talked about breathing and articulation and had some fun with mental imagery, making up our own little duets. After the lesson was 'officially' over, we did some more stuff. I gave him a bit of a fun demonstration. We're going to try to post a short video clip on our website and if it works, I'll post the URL here soon. In the meantime, here's a still photo from this fun session. UPDATE: We figured out how to post the video on the website and here on this blog! The focus and sound quality aren't the best, but we hope you get the idea! :-) Click here to see it. Today, I had lots of time to myself. 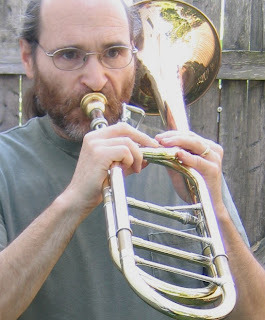 Me, my Self and the trombone. I am a very diligent practicer of basic routines and exercises. But, after an early warmup routine and rehearsal today, I went home and felt like, playing... playing what was in me. Unrushed, unscheduled, unroutined... playing simple, little melodies like: Bb, Ab, Gb, Db and Eb, slowly, at first, feeling and listening to what was inside the resonance. My feeling became the resonance of the sound. Then I thought if I had to do this in front of people, the environment and my state of mind wouldn't be what it is now. That's the problem, sometimes, in "performing." That's why I believe it helps to tune the audience so they become a supportive acoustic or supportive environment, so the connection can be made easier and deeper. Spending time... building a close relationship with the process of playing. Not just focusing on results - "Is it good?" "Is it bad?" - just being with what is... you, the music, the moment, a moment in eternity. My wife and I went to a good local breakfast place this morning. I noticed this really little kid sitting right next to us having breakfeast with his parents. At one point, the child started saying something very loudly, which was also very funny. I turned to the mother and said, " Very impressive!" She then said to me, "You should have heard him the other day singing 'I've been Working on the Railroad' to everyone in the restaurant!" She mentioned that his pitch is getting very good. I then asked, kiddingly, "What about his rhythm?" to which she responded, "His rhythm is great!" I asked her what his sign was and she said, "Gemini." I told her we know some great percussionists who are Geminis! At that moment, the older man in back of us waved his hand and said," I'm a Gemini and I'm a drummer! I play every night at the club across the street." We all laughed and the mother of the child said she also was a drummer, but her sign is Scorpio! Thia breakfeast was such a fun, upbeat expereience with these people all chiming in. It was nice to feel a connection with people we never met before. What an unexpected delight! Times like this make you think what a wonderful world it could be. For the first time in quite awhile I played my horn outside in a very large field. What a difference in sound and in my whole being! The sound has a certain purity outside, especially in this location because it had a considerable echo. A sense of freedom came over me. I could feel certain inhibitions fall away as I let my self go into a sea of sound and expression. It was a beautiful day with the green of the trees silhouetting against the rich blue sky. To not feel encased by a small square or rectangular space is very liberating and definitely engages other parts of our bodies and minds. It reminded me of when I first thought of three diminsional sound. Feeling the sound come from all angles. That was in 1969 on a farm in southern Minnesota. I would aim at a tree about 300 hundred yards away and see if my sound could travel to that distance. It was a great feeling and my band director heard the difference! If you can play full and projected outside, it is no problem indoors, especially if you keep the outdoors mindset, IF they let you! Here is an excerpt of a piece that was inspired outdoors, with the wind and the pond and myself as one, written in 1996. It's called "By the Pond, In the Wind" from my "Anew at Home" CD. Sound clip from "Approaching the First Gate," on my "Anew at Home" CD. Enjoy!